We've got some really good improvements to your bus services starting 13 June 2016. Changes will effect routes 22, 22A, 44, 73A & 83. Route 22: On Saturday's the 13:40 journey from Grays to Aveley, Usk Rd has been replaced with 13:30 & 13:50 journeys. 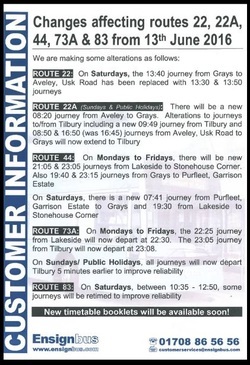 Route 22A (Sundays and Public Holidays): There will be a new 08:20 journey from Aveley to Grays. Alterations to journeys to/from Tilbury including a new 09:49 journey from Tilbury and 08:50 & 16:50 (was 16:45) journeys from Aveley. Usk Rd to Grays will now extend to Tilbury. Route 44: On Mondays to Fridays there will be new 21:05 & 23:05 journeys from Lakeside to Stonehouse Corner. Also 19:40 & 21:15 journeys from Grays to Purfleet, Garrison Estate. On Saturdays, there is a new 07:41 journey from Purfleet Garrison Estate to Grays and 19:30 from Lakeside to Stonehouse Corner. Route 73A: On Mondays to Fridays the 22:25 journey from Lakeside will now depart at 22:30. The 23:05 journey from Tilbury will now depart at 23:08. On Sundays and Public Holidays all journeys will now depart Tilbury 5 minutes earlier to improve reliability.